A fascinating, revelatory novel based on the true story of the ship, and its crew, that failed to come to the sinking Titanic's aid. 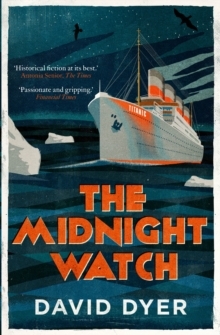 Set on board the Californian during those terrible hours, and in Boston in the aftermath of the disaster, Antonia Senior has called 'historical fiction at its best'. A perfect read for fans of Robert Harris and CJ Sansom, which gives a whole new side to A Night To Remember. On a black night in April 1912, fifteen hundred passengers and crew perish as the Titanic slowly sinks beneath the freezing waters of the North Atlantic. Charting the same perilous course through the icebergs is the SS Californian, close enough for her crew to see the eight white distress rockets fired by the Titanic. Yet the Californian fails to act, and later her crew insist that they saw nothing. As news of the disaster spreads throughout America, journalists begin a feeding frenzy, desperate for stories. John Steadman is one such reporter, a man broken by alcoholism, grief and a failed marriage. Steadman senses blood as he fixates on the Californian and his investigation reveals a tense and perplexing relationship between the ship's captain and second officer, who hold the secrets of what occurred that night. Slowly he peels back the layers of deception, and his final, stunning revelation of what happened while the Titanic sank will either redeem the men of the Californian, or destroy them.